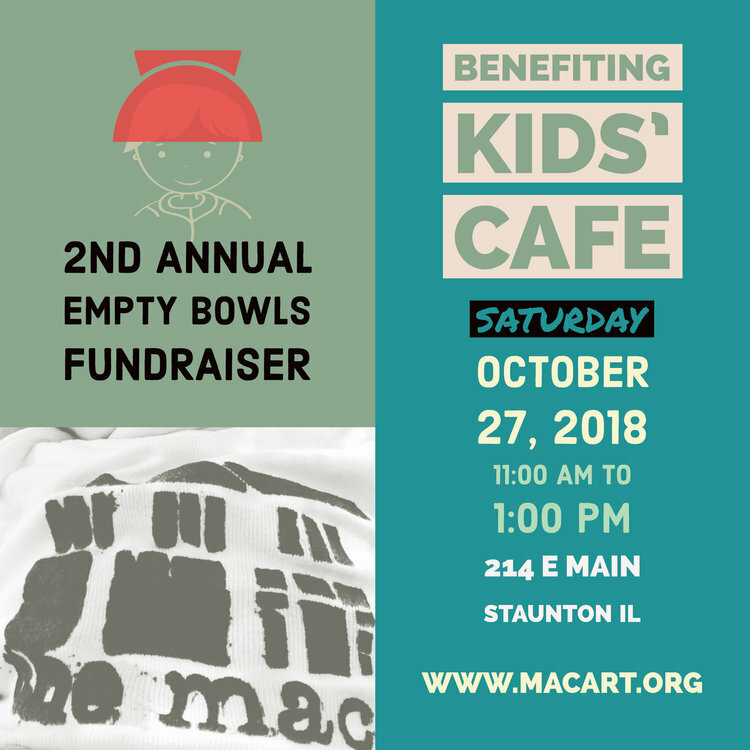 The Macoupin Art Collective is partnering with Staunton's Kids Cafe for a fundraising event highlighting the strengths and goals of both organizations. The MAC will teach members of the community to make handmade ceramic bowls, and Kids Cafe will fill those bowls, all to bring attention to the millions of kids who don't know where their next meal is coming from. At our Empty Bowls fundraiser event, you can purchase one of the handmade ceramic bowls made by the staff and students of The MAC, the Kids Cafe staff will fill that bowl with some tasty hot soup, and all the proceeds will help Kids Cafe provide meals to kids in need. If you want to help The MAC and Kids Cafe feed hungry kids, come see us for one of the events listed above. During our bowl-making days, you can come in and learn from The MAC's resident potter, Brandace Cloud, how to make a slab-built clay bowl. No experience necessary for this free workshop. The only cost is that you'll donate your finished pieces to The MAC for the Empty Bowls fundraiser. During our glazing days, you will glaze one of the bisque-fired bowls that you or another student has made. During the actual Empty Bowls Sale, you can volunteer to help out with setup or cleanup, buy a bowl filled with tasty hot soup, or just show your support by coming out and inviting your friends.